The Monster of Peladon, a six-part story, which aired from 23 March to 27 April, 1964, penned by Brian Hayles is Pertwee’s penultimate tale. I can’t believe his time in the TARDIS is almost up! He’s been a lot of fun. 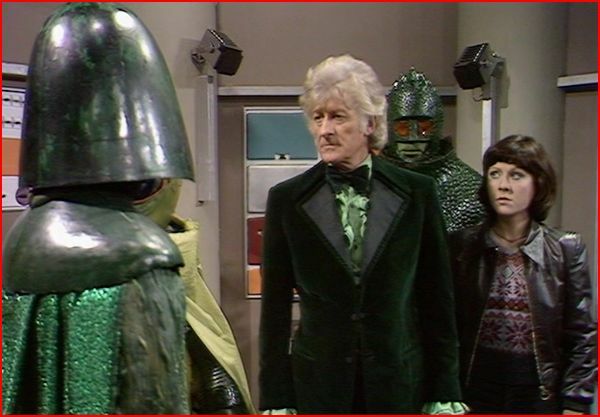 The Doctor (Pertwee), with Sarah-Jane (Elisabeth Sladen) at his side, returns to the planet of Peladon some years after his previous visit. And while there may be a familiar face or two around, like the monstrous Aggedor (Nick Hobbs) and Alpha Centauri (Ysanne Churchman), much has changed since the Doctor was last here. A young queen, Thalira (Nina Thomas) sits upon the throne, who is being advised by her chancellor Ortron (Frank Gatliff) a man who seems to make sure he enjoys all the bonuses the treaty with the federation can provide while maintaining the feudal system, and virtual slavery of those classes beneath the ruling family, particularly the miners, who are anxious about working with the federation mining party as they are using equipment and tools they don’t understand and fear. And it seems that perhaps the Aggedor agrees with them, as bodies begin to turn up. While the Time Lord works to serve as a go-between for the miners and the queen, trouble gets stirred up by the arrival of a band of Ice Warriors, claiming to be sent by the federation council, but as is quickly revealed, as war seems imminent, that they are there for their own interests, and may be working with someone inside the federation!! When they establish martial law, and begin to put a tighter grip on the planet, revelations about those involved are made, and it will be up to Sarah-Jane and the Doctor to try to put things right, find a more equal democratic balance for Peladon and alert the federation to the danger these rogue Ice Warriors present to the planet. The miners rise up, the planet is saved, and the Doctor learns the truth of the deaths purportedly caused by the Aggedor. Overall, a solid tale, though I think it could have been squeezed down to 5 if not 4 parts… still, it’s such a joy to watch Pertwee enjoying his character that you don’t mind the extra time spent with him. Next time, he and Sarah-Jane encounter the Planet of the Spiders, where something will cause him to have to regenerate by story’s end! !